It looks like we'll soon be getting a new gaming magazine dedicated to MMORPG. Indeed, the folks behind Computer Games magazine will soon release MASSIVE Magazine. Personally I'm very much for this, and will certainly check out the first issue. From the media kit they offer, it seems they know pretty well their audience and have done their homework. SO far so good. MASSIVE Magazine is the ultimate guide to the world of massively multiplayer online games. It covers the games and culture with a progressive and breezy editorial style produced by the top writers in the industry. 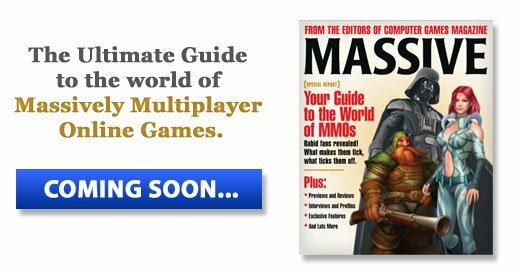 Issues of MASSIVE will include features on the games, their communities, guilds, profiles of top players, and other features that will make the magazine a part of the MMO world. Aggressive promotion campaign scheduled at Barnes & Noble, Books-A-Million, and all other retailers. Newsstand price $5.99-compared to similar publications which are $9.99-this will be a great deal! Congrats to Nick Yee (from the Daedalus Project) by the way, for being quoted as a source - that's what good research is for. Over the last few years I've slowly reduced my number of magazine subscriptions from about 7 to currently 2 (well actually 3 if you count E:ON). And with all the blogs, gaming sites, web 2.0 sites and others that I read daily, it would have been impossible to read all of them had I kept all my subscriptions. Now, with a magazine geared towards MMORPGs, I'm glad I didn't.